The Racer made its maiden flight in the spring of 1926. Later that year, however, it was badly damaged in an emergency landing at Westland's Yeovil factory. It was decided to rebuild the aircraft as a fighter, with a new, all-metal, fuselage. 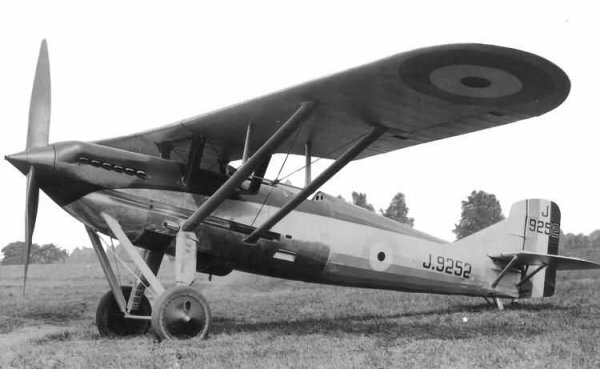 The Falcon was replaced by one of Rolls-Royce's new F.XI (later known as the Kestrel engines giving 490 hp (366 kW) in a more streamlined nose, while two Vickers machine guns were mounted semi-externally in the fuselage sides. It retained the wooden parasol wing of the Racer, which was mounted close to the fuselage on tandem pylons on the fuselage centreline. The undercarriage was of tail wheel type, while the thick section wing allowed the aircraft's fuel tanks to be buried in the wing, saving space in the fuselage while keeping wing drag low, also allowing a gravity feed to the engine and reducing fire risks. The cockpit was more or less in line with the trailing edge of the wing. The seat was of such a height that the pilot's eyes were in the neighbourhood of being level with the wing. This enabled him to look either over or under the wing. The height of the seat was adjustable on the ground, and the rudder bar could be set up for two positions to suit different pilots. The rebuilt aircraft, now known as the Wizard, flew in November 1927. The Wizard was fast and had impressive climb performance, and was tested by the Aeroplane and Armament Experimental Establishment (A&AEE) at RAF Martlesham Heath from the end of January 1928. While the A&AEEs test pilots praised the Wizard's performance, they criticised the pilot's forward view and considered the aileron control loads too heavy. During the summer of 1928, the Wizard made its first public appearance at the Royal Air Force Display at Hendon, among the other new single-seater fighters. The Wizard attracted a great deal of attention, mainly because of its clean lines and generally attractive appearance, as well as its unusual layout - parasol monoplane designs had not been in service with the Royal Air Force since the days of the First World War - when a number of Morane-Saulnier's were used. Since then the RAF had used biplanes or at most sesquiplanes for its fighters. 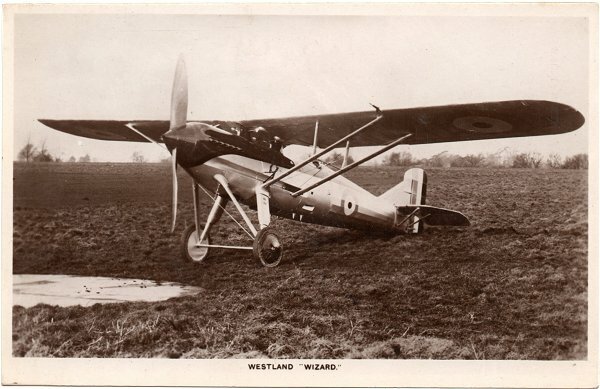 A 1920's postcard of the Westland Wizard. A Westland Wizard Mk II. 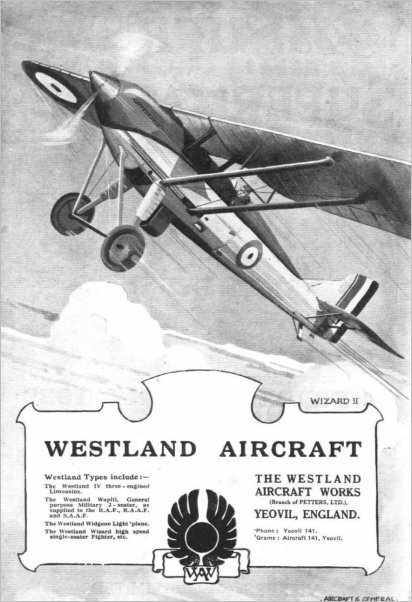 An advertisement of 1929 for the Westland Wizard Mk II.